Last update was crystal clear that it was "bears' turn; bulls should stand aside" -- and I probably couldn't have offered better advice for Friday's session, which turned into a waterfall decline and closed near the session lows. We are in difficult predictive territory because we don't yet have one clear larger fractal, and the market seems to have chosen the same route it chose on the way up, which was extended fifths. Extended fifths tend to offer extension upon extension with very little breaks in the opposite direction, as we saw during the rally of the past few months. The decline may choose to go that route, so don't get too attached to the potential B-wave I've sketched in on the chart below. Once wave A finds a bottom, we can come up with a more accurate picture -- since the B-wave fractal and the C-wave fractal are both built from the A-wave fractal. 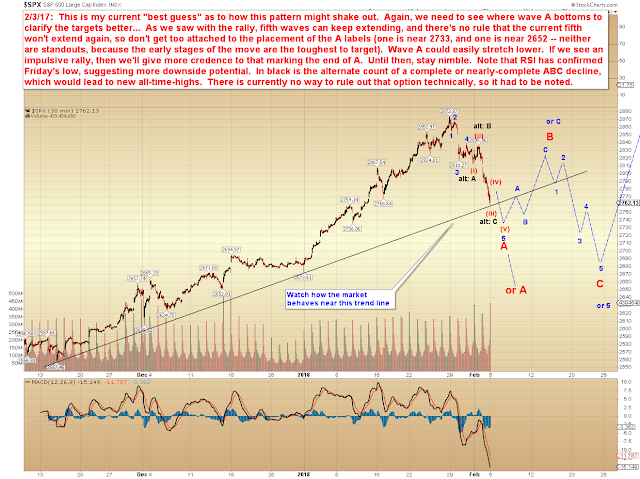 Really, until the A-wave finds a bottom, I can only blindly speculate on the B and C waves. 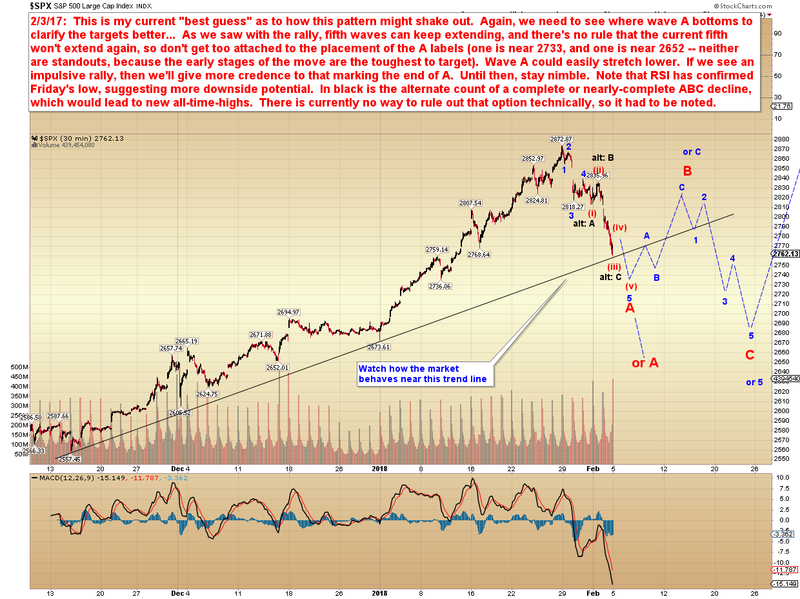 It's possible that the A-wave will continue to waterfall in an ongoing series of extended fifths, or it's possible that the extended fifth which seems to be nearing completion will mark the bottom of this wave -- we can only watch and wait. 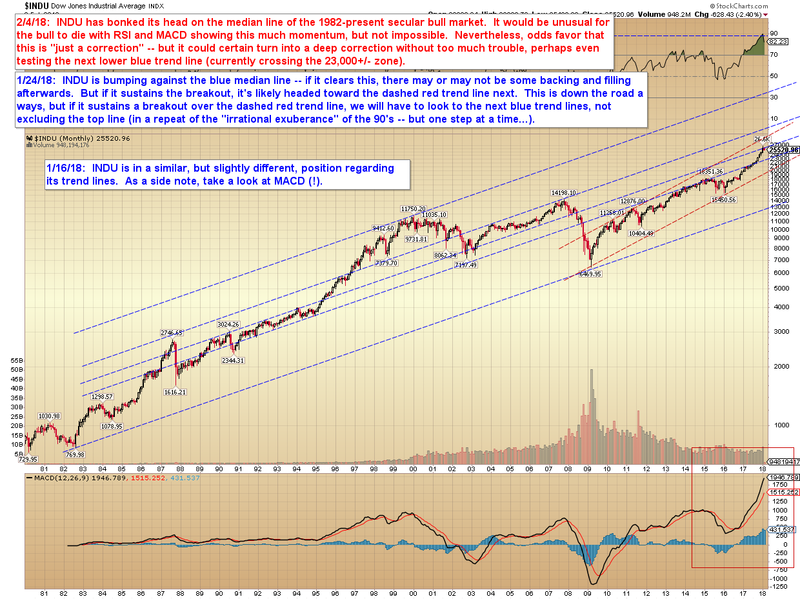 Our first signal of a tradeable bottom will be an impulsive rally. 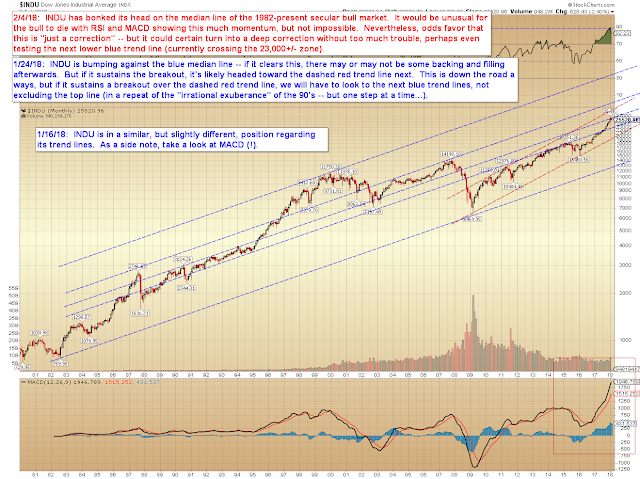 INDU shows us that there is potentially a lot of room for a correction to run. Even if we're not dealing with the Minor Fourth wave discussed in the prior update (via the NASDAQ Composite (COMPQ)), there is plenty of room for a smaller fourth to drop substantially, to the tune of a couple thousand points in the Dow. In conclusion, it's worth noting that the first downside targets I presented in the prior update were both captured. SPX's second target was 2735-45, which could be captured right at the open. If SPX keeps dropping through 2724, then the next obvious horizontal support doesn't show up until 2695, then 2673. It's also worth mentioning that one potential target method suggests that the final target of this move could be as low as 2229 SPX -- and we could get there faster than seems reasonable. That's not a prediction yet, just a cautionary mention. Trade safe.